For centuries, different groups have sought refuge in the United Kingdom. In the late 17th century, the Protestant Huguenots came from France, bringing little except their skills in weaving, in order to escape religious persecution under King Louis XIV of France. Calling their journey Le Refuge, up to 700,000 French came to England between 1685 and 1688. Whilst there were some French settled around Soho, the East End became home to the majority of the Huguenot migrants in this time. Bethnal Green, Spitalfields, Whitechapel and Shoreditch all became popular weaving areas, partially due to the immigration of the Huguenot weavers. Weavers would aim to work outside the walls of the City of London in order to avoid levies issued by the Guilds. In 1685, the Edict of Nantes was revoked, which had formerly made Huguenot Protestants’ worship legal and acceptable in designated areas in France. Charles II of England allowed Protestant refugees to enter England with their goods free of duty in 1681 under public pressure and forecasted benefit to economy: although Charles could not have predicted the benefit of the Huguenots to England! Shortly before their arrival, over £63,000 was raised in order to accommodate the Huguenots, and Charles II set up a charity and public commission for their welfare in 1687. Protestants, generous individuals, silk throwsters and weavers all put means in place for their welcome and their assimilation into English society. workshops, they left a relatively little architectural footprint in London, and their contribution to London’s economy is sometimes forgotten. However, their presence can be found in the large houses in the East End which were built for the weavers and silk merchants in the 17th and 18th centuries, which have large windows which allowed weavers to work later into the night. In fact, the Protestant Refugees from High and Low Normandy Friendly Society once visited Oxford House in 1948 and held a meeting here. 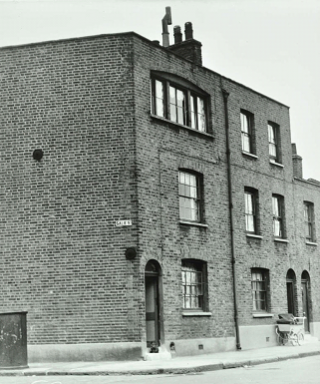 They also met at the Norfolk Arms in Bethnal Green in 1898. So the Norman Protestants are directly connected not just to Bethnal Green but to Oxford House itself! 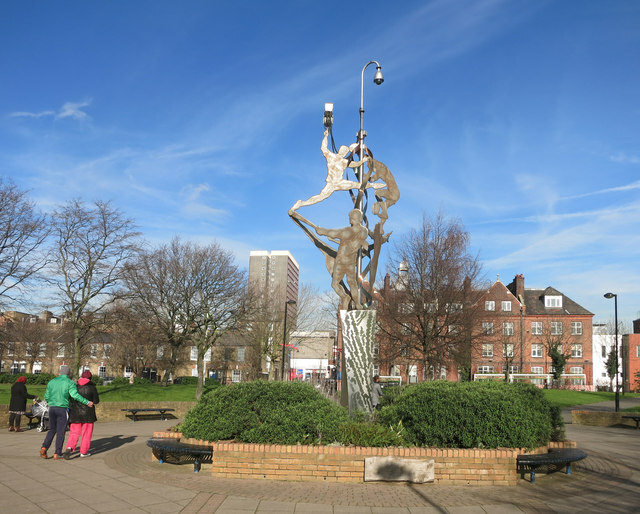 Perhaps the most visible memorial to the weavers and Huguenots is the Weavers’ Fields park, situated immediately behind Oxford House. In 1963 the Council agreed with the London County Council to commemorate the historic silk weaving industry with the name, Weavers’ Fields. Moreover, the Brick Lane masjid (mosque) was formerly a Huguenot chapel and later a Jewish synagogue, reflecting the ever-changing cultural diversity of the East End. The artworks on show in Weavers’ Fields celebrate the area’s silk weaving history; wind-vanes depict silk moth and mulberry leaves (used in silk weaving) whilst the entrance sign is ‘interwoven’ with metal, as if textile. 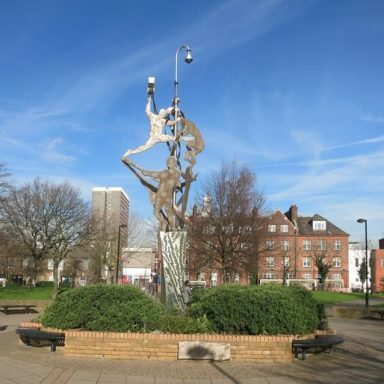 Moreover, Peter Dunn completed the sculpture Weaving Identities, which references local sporting achievement of young people as well as the weaving history of the area. It is surrounded by four-hundred bricks, hand-carved by local young people, which means that they can ‘own’ a part of the park. 1. Weavers’ Fields, with a view of Oxford House in the background. Geograph.org.uk, non-commercial re-use. 2. A weaver’s house, with large windows. Collage; collage.cityoflondon.gov.uk, with explicit permission. 3. 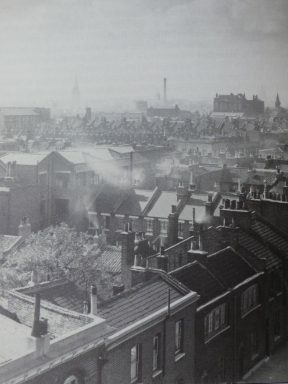 A view of 1930s Bethnal Green. “100 Years of Work in The Community”, Mandy Ashworth. Oxford House.